Welcome to Part 2 of the Lip Balm and Treatment Series, featuring lip balms from Fresh f21c (again), Kevyn Aucoin, and Lierac. First thing I want to touch on is the difference between the Fresh Sugar Nourishing Lip Balm I reviewed in Part 1, and the Fresh Sugar Lip Treatment here in Part 2. Of course there are the obvious differences, like one is in stick form and the other is in a jar, but there are also important differences in their ingredients. … I’m actually trying to lead up to an apology here, because when I reviewed Sugar Nourishing Lip Balm I failed to notice and point out a key ingredient: menthol. I told you the balm was sweet and minty but in fact it doesn’t just contain a bit of mint leaf like I’d assumed. Instead it contains menthol. Along with camphor and eucalyptus, menthol is actually a skin irritant. Yet it’s often be found in lip balms, which really puzzles me. Upon application menthol may help to cool or numb already irritated lips. But it’s not going to allow or help your lips heal if they’re raw or dry. Menthol, camphor, and eucalyptus facilitate the cycle of irritation, and are major factors in the reason people become “addicted” to lip balm. Therefore, my opinion is that menthol, camphor, and eucalyptus are bad ingredients and if you see them on an ingredient list you should not buy that lip product. I’m hereby marking Fresh f21c Nourishing Lip Balm Advanced Therapy as an “I do not recommend” product. In this Part 2, let’s first look at the ingredients list for the balms I’m reviewing. As you scroll down you may almost miss the ingredient list for Kevyn Aucoin The Sensual Lip Balm… Yes, it seriously only contains THREE ingredients! What lovely, refreshing, simplicity! The other two balms contain a greater mix of ingredients, mainly the oils, butters, and waxes I like to see in a lip balm. Fresh Sugar Lip Treatment Ingredients: Cera Alba (Beeswax), Simmondsia Chinensis (Jojoba) Seed Oil, Hydrogenated Olive Oil Decyl Esters, Hydrogenated Palm Kernel Glycerides, Ricinus Communis (Castor) Seed Oil, Vitis Vinifera (Grape) Seed Oil, Fragrance, Ethylhexyl Palmitate, Hydrogenated Palm Glycerides, Theobroma Grandiflorum Seed Butter, Prunus Domestica Seed Oil, Copernicia Cerifera (Carnauba) Wax, Limnanthes Alba (Meadowfoam) Seed Oil, Passiflora Incarnata Seed Oil, Hydrogenated Vegetable Oil, Crithmum Maritimum Extract, Commiphora Mukul Resin Extract, Ribes Nigrum (Black Currant) Seed Oil, Ascorbyl Tetraisopalmitate, Tocopherol, Tocopheryl Acetate, PEG-6 Isostearate, Caprylic/Capric Triglyceride, Ammonium Glycyrrhizate, Sucrose Tetrastearate Triacetate, Trihydroxystearin, Hesperetin Laurate, Vanillin, Butylene Glycol, Caprylyl Glycol, Sodium Hyaluronate, Hexylene Glycol, Ascorbyl Palmitate, Limonene, Benzyl Alcohol, Linalool, Citral, BHT, Phenoxyethanol. Kevyn Aucoin The Sensual Lip Balm Ingredients: Hydrogenated Rice Bran Oil, Oryza Sativa (Rice) Bran Wax, Oryzanol. Lierac Hydro-Chrono Plus Lip Balm Ingredients: Bis-Diglyceryl Polyacyladipate-2, Hydrogenated Polydecene, Ozokerite, Ethylhexyl Methoxycinnamate, Peg-5 Pentaerythrityl Ether, Ppg-5 Pentaerythrityl Ether, Butyrospermum Parkii (Shea) Butter, Butyl Methoxydibenzoylmethane, Ethylhexyl Salicylate, Glycine Soja (Soybean) Oil, Synthetic Wax, Polybutene, Theobroma Cacao (Cocoa) Seed Butter, Rosa Damascena Flower Wax (Cera), Ricinus Communis (Castor) Seed Oil, Fragrance (Parfum), Tocopheryl Acetate, Diisostearyl Malate, Ethyl Linoleate, Retinyl Palmitate, Ethyl Oleate, Ethyl Palmitate, Ethyl Stearate, Ethyl Linolenate, Trihydroxypalmitamidohydroxypropyl Myristyl Ether, Ethylene/Propylene Copolymer, Silica, Citric Acid, BHT, Lecithin, Tocopherol, Calcium Aluminum Borosilicate, Titanium Dioxide (Ci 77891), Tin Oxide (Ci 77861). Smell and Taste: Of the three balms, Fresh appeals most to me in terms of the scent and taste. If you’re not familiar with Fresh, I’ll explain that their “sugar” smells like a sweet, lemony, candy store. I happen to really love the scent (and accompanying sweet taste) but it’s not subtle, so if you dislike scented balms you should perhaps pass on this. Kevyn Aucoin’s balm has no added scents or flavors, and really its ingredient do not provide any smell or taste to me personally. Lierac’s Hydra-Chrono balm has a gentle candy scent that some may call perfumey. The scent neither appeals to or bothers me in particular, and luckily the balm does not carry any chemically or distracting flavors along with the smell. 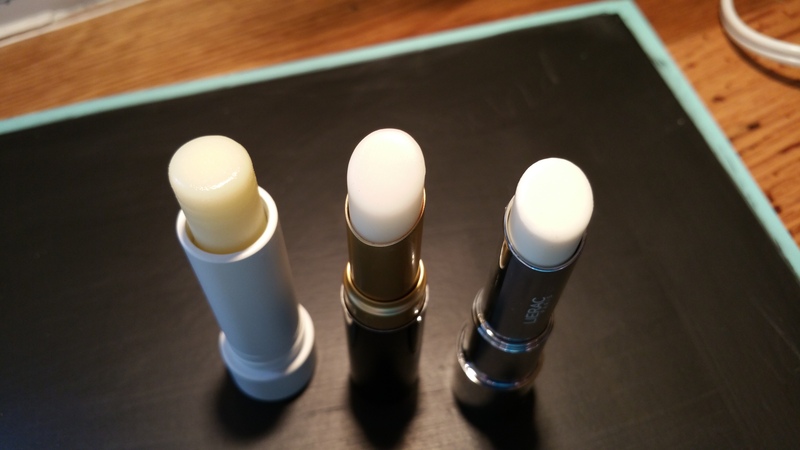 All three of these balms take more than one quick swipe to make my lips feel covered. Of the three, I’d say that The Sensual Lip Balm takes the longest to apply because it’s doesn’t have much natural body. I have to put on like five good swipes to feel done. I also have a bit of work to do to get enough Lierac on my lips to feel “balmed.” Even then, my lips will feel very slick, but with not enough of a secure barrier accompanying it. However, the balms with thinner consistency make great multi-taskers to keep handy. You really can use these balms on your fingernails and cuticles, irritated skin, and ends of your hair! 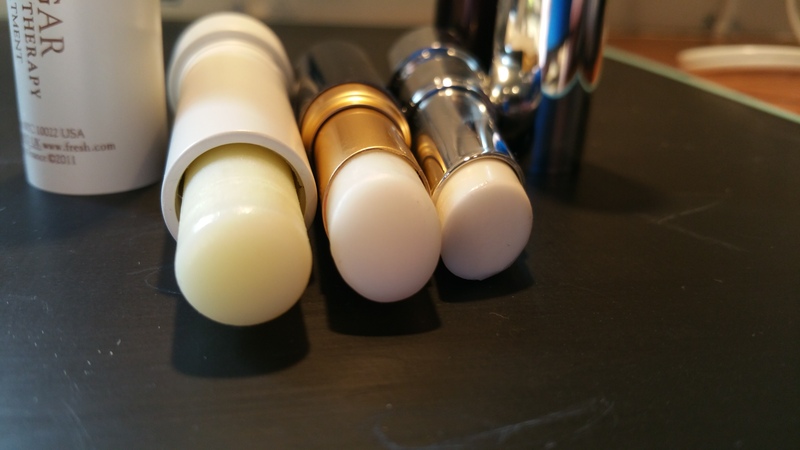 All three balms come in swivel-up sticks, with Fresh being the only one to feature a rounded, traditional balm shape. I happen to like that better than a slanted tip applicator. Each comes in an upscalish tube, with Fresh being my favorite, again. Fresh tubes are made of medium weight metal. The downside is that Fresh tubes scratch easily and end up looking worn after a while. But the Fresh twist cap has probably saved me from many, many, handbag accidents. (Marc Jacobs’ balm also has a twist-on cap.) Both Lierac Hydra-Chrono and The Sensual Balm come in unexpectedly heavy, sleek, metal cases of their respective designs. 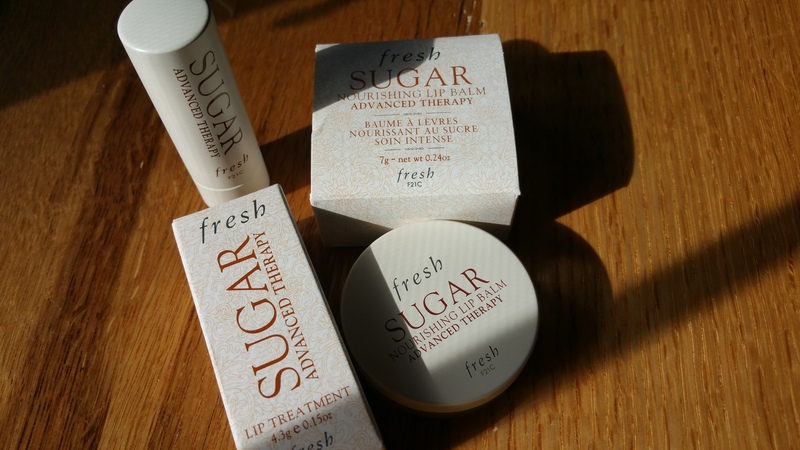 I may as well spill the beans and tell you that I’ve purchased and re-purchased Fresh Sugar Lip Treatment again and again, and that I love it. (I also have many colors of the tinted Fresh Sugar Lip Treatments, but I can’t wear them regularly because they contain chemical SPF.) My opinion is that this non-SPF’ed version of the Sugar Lip Treatment is a near perfect lip balm in terms of performance, brand appeal, and luxe-ness. My lips love this stuff. As for Kevyn Aucoin’s The Sensual Lip Balm and Lierac Hydra-Chrono Plus Lip Balm, I don’t forsee myself becoming a regular user of either one. I really do appreciate The Sensual Lip Balm for it’s minimal ingredients and lack of capacity to irritate skin, but it doesn’t wear like the balm I crave. It doesn’t have any thickness or body that would provide me comfort until it wears off. I have a feeling the rice bran oil/ waxes do condition my lips, but even with it on I feel the need to have a waxy layer or something to top it off. It also doesn’t especially appeal to me aesthetically, and it’s pricey. I was really excited about getting the Lierac balm, but for some reason I really can’t pin point, it doesn’t make my lips feel conditioned. After application I can feel it on my lips, and the feeling does not bother me. But it doesn’t really help me out. Again, I don’t know why this is, and can’t find any particular ingredient that would counteract the good ones in its list. But because of this I won’t be buying this one again either. I have a confession, though. 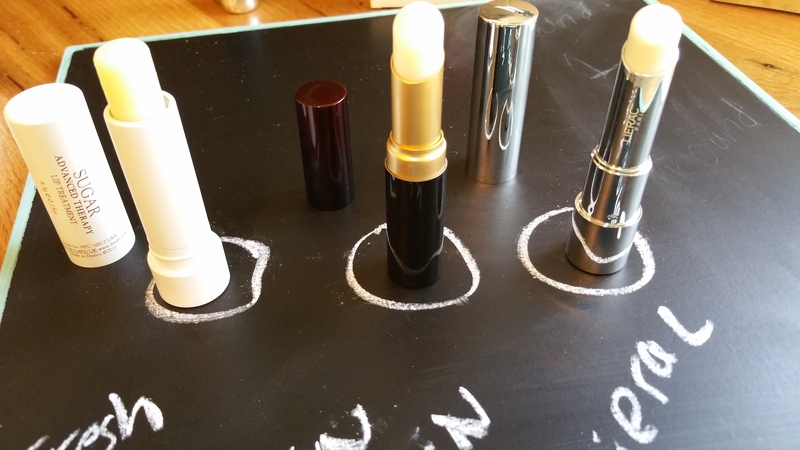 I’m still dreaming of the Marc Jacobs Lip Lock Moisture Balm I reviewed in Part 1. I just wish so badly that it didn’t contain chemical SPF because it made a huge impression on me!